After I pulled off the nth pepper due to sunscald it occurred to me that practically all of them were from the Islander pepper plants, which is weird because the other pepper plants get a few more hours of sun than these do. Maybe they're more prone to sunscald because of their dark coloring? They retain more heat than the lighter colored ones? Who knows! I'll move them and see if that helps. We are lucky to not have this problem yet. However, many of your tomato plants were scalded from the summer heat. Leaves burnt to a crisp. This summer's heat was brutal! I'm glad the weather is winding down. I don't miss having to water everyday. 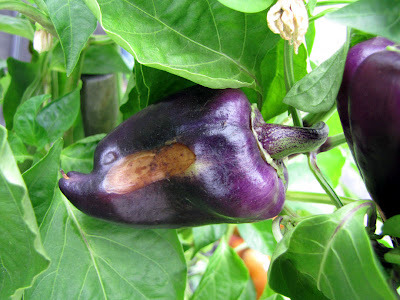 Many of our peppers had the same problem. I figured it was heat related but thanks for giving the problem a name. Anyway we harvested the peppers and just cut out the sun-scalded part. The rest of the pepper tasted just fine.